One way to get a feel for the school and the community here is to visit our 70-acre campus for yourself. From the academic departments to the facilities and grounds, there’s a lot to take in, but we’re confident that you’ll like what you see. One way to truly get a feel for the Academy, its approach and the community here is to visit our 70-acre campus for yourself. 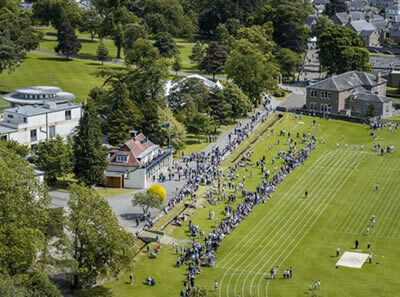 From the various academic departments to the sports facilities, the grounds to the accommodation – there’s a lot for visitors to take in, but we’re confident that you and your children will like what you see. Contact us to arrange a tour, or view more of the campus on our virtual map. A talking point in their own right, the school’s grounds are incredibly photogenic. A beautifully maintained mix of mature trees, gardens and architectural features add to the atmosphere. All contained within a single campus, ​​we’re hugely fortunate to have such easy access to these features. Not only can pupils travel quickly between lessons, they can easily make the most of what Dollar itself has to offer and the many virtues of the Academy’s surrounding area. There is an extensive network of school bus and coaches bringing pupils into school along routes from Aberdour, Auchterarder, Alloa, Bannockburn, Bridge of Allan, Dunblane, Dunfermline, Falkirk, Glenrothes, Hillfoots, Linlithgow, Limekilns, Perth, St Andrews, and Stirling.